home / location & lifestyle / blog / the villages at brunswick forest are shaping up! The Villages at Brunswick Forest are currently under construction experiencing even more growth and adding new businesses to the already impressive roster. The newest building in The Villages shopping center will be 7,253 square feet and will offer mixed retail and services. Completion of the newest addition is expected early 2014, but you don’t have to wait to see how things are shaping up. Click here to view our progress photos! Staying up to date on the latest happenings in The Villages is now easier than ever with the BRAND NEW Villages at Brunswick Forest website! This easy to use website is designed to keep you connected and provide you with business information, event happenings, progress photos and more. You can even sign-up for The Villages at Brunswick Forest e-newsletter that brings updates, events and coupon specials right to your inbox! 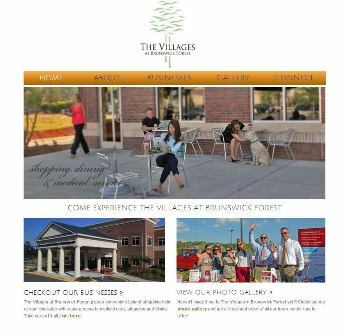 Check out the new website today at www.VillagesatBrunswickForest.com.